For most promoters, a full slate of MABRAcross racing is plenty. 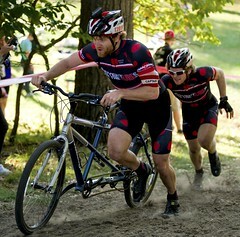 But the go-getters at DCMTB wanted more so they added races for rookies, single-speeds and tandems to the DCCX slate. For those that stuck around late in the day, these races were some of the most entertaining on the schedule. The tandem race, in particular, did not disappoint. Twelve teams signed up and eleven were brave enough to toe the line. Many of the racers were lining up for their third race of the day. Looking at the start list, it was safe to say that the race favorites in the tandem class were familiar names to MABRAcross prognosticators. Jared Nieters, MABRAcross series leader, and Joe Dombrowski, the winner of the day’s elite race, looked strong on paper as they squeezed their Haymarket Bicycles-SEAVS rig onto the front row. But a slow start and nagging mechanicals seemed to dog them along the way. Lined up next to Nieters and Dombrowski was the Adventures for the Cure tandem piloted by Adam Driscoll with Pat Blair as stoker. If you don’t know much about these guys, let’s just say they spend way too much time together. They have ridden across the country together on fixed-gear bikes, completed the two-man Race Across America, and are pretty much inseparable if the activity has anything to do with bikes. In fact, they get mistaken for each other so much at bike races that I believe they just take on the other’s persona when someone can’t tell them apart. I point this out about Driscoll and Blair because their communication on the bike is incredible. You can hear it on the video in the turns and through the barriers. Another team that does a nice job communicating is the TOMS Shoes p/b Kindhuman Sports team of Matt and Chad Bartlett. The brothers have more fun on a bicycle then should be allowed. We get to hear them discussing the set up to their big air moment and also heckling the other TOMS Shoes rig. Needless to say, these guys also get confused for each other. Maybe that’s the key to tandem cross success. If you like what you see and want to try it out for yourself, you can do just that at Rockburn Cross, day two of the Howard County Double Cross. Early word is that this is going to be an epic rematch of the top three teams, with other strong challengers on hand to make it spicy. For the video we went into unchartered territory. Three helmet cams, one camcorder outside the tape and a whole lot of footage. I’ve edited it down to about 13 minutes but I’m sure there is a whole lot more to go through that was left on the cutting room floor. Thanks to John Cutler for the background music and thank you for watching. I’d like to see a tandem solo class. OH MY GOD THIS IS THE MOST BEAUTIFUL VIDIEO I HAVE EVER SAW IN MY LIFE! YOU HAVE REDEEM YOURSEFL WITH THIS ONE! Maybe this kind of event will keep cross in the region from getting TOO serious. Driscoll has Birgitta and I considering putting Kenda 35s on to race at Rockburn. Maybe we will have the Husband/Wife category locked up. Wait I may have jinxed our chances. Nicely edited Bill. Keep’em coming. Great stuff, got to see our bad remount. Was fun If we didn’t loose our pedal twice I think we could of challenged the Tom Tom boys. I think that next year the tandem race should be at noon followed by the junior race so that folks don’t have to stick around until 4:40 to watch it! this is awesome. Great video work! This was the highlight of DCCX for sure. @Darren: Challenge accepted. Keep your pedals on for Rockburn. Great video. Did anyone bring tandem for the pit? Loved watching the “dueling” tandem cams and what it looked liked from the side lines! I’m so sad I had to leave before the tandem race, but great video! Makes me want to find a tandem and a stoker for Rockburn. Time to get all the CXHairs corporate backers to lobby USAC to scrap the proposed rule change banning helmet cams before they take all the fun out of things.